TORONTO - Pascal Siakam got chants of “MVP, MVP.” Jeremy Lin, just hours after landing in Toronto, got a standing ovation as he made his Raptors debut. It made for a feel-good night as Toronto, fuelled by Siakam's career-high 44 points in the absence of Kawhi Leonard (knee), held on to defeat the Washington Wizards 129-120 Wednesday in a back-and-forth game. The Raptors (43-16) head into the NBA all-star break on a six-game winning streak. Their 43 wins before the break are a franchise record. Toronto has won 13 of its last 14 at home and is 24-5 this season at Scotiabank Arena. “I like us and I think there's still a lot of room for improvement,” said coach Nick Nurse. “I feel like we play really really well at times. I think there's times when we don't play so well but it doesn't seem to bother us that much. We get down eight or 10, 12 (and) we seem to get back in it quickly sometimes. Close games, I think, we seem pretty calm. OG Anunoby also had a career high with 22 points. Lin finished with eight points, five assists and five rebounds in 25 minutes off the bench. Siakam became the 11th player in franchise history to score 40 points in a game. Thirty of his points came in the second half, just one off his previous game high of 31 points. And the 24-year-old from Cameroon dug deep into his toolbox in doing it. He made 15-of-25 shots, including four three-pointers, and 10-of-12 free throws, all career highs. Not to mention some juicy dunks. “I knew he was good but tonight was something special,” said Lin. Siakam savoured the night although he said he's just doing his job, working hard at his trade every day. But he acknowledged the night had him thinking of his father, Tchamo Siakam, who was killed in a car accident in 2014 while Pascal was attending New Mexico State. Siakam left the game to a standing ovation with 27 seconds left. “I just wish my Dad was there to watch that ... thinking how proud he would be of me,” he said. After trailing by 10 early, Washington was up by six at the half and pushed the lead to 12 in the third at 80-68. But a 15-0 run put Toronto up by three, turning the tide with 4:43 remaining in the quarter. The Raptors, stiffening their defence, outscored the Wizards 44-28 in the third and shot .696 (16-of-23) from the field in the third to lead 103-93. Washington (24-34) kept clawing its way back and got to within one at 112-111. 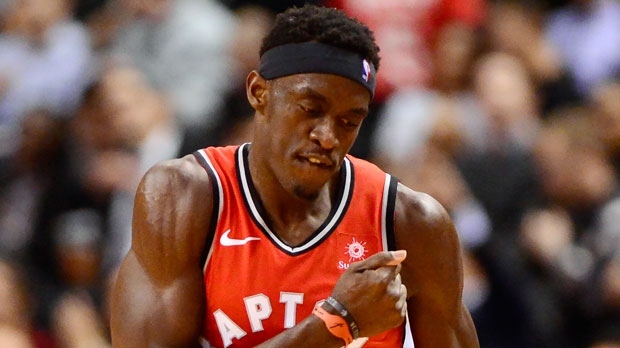 But Kyle Lowry and Siakam reeled off a 7-0 run and Toronto held firm the rest of the way as the Wizard fightback faded. Toronto has won all four games against Washington this season. It was the last game for both teams before the all-star break. The Raptors and Wizards resume play Feb. 22, with Toronto welcoming DeMar DeRozan and the San Antonio Spurs. Both teams had six players in double figures. Bradley Beal and Jeff Green led Washington with 28 and 23, respectively. Jabari Parker had 22. Lowry had 14 points and 13 assists. Serge Ibaka also had a double-double with 10 points and 13 rebounds. The Wizards, coming off a 121-112 loss Monday in Detroit, have lost five of their last seven. Toronto was the third stop of a four-game road trip. Nurse started Lowry, Siakam, Ibaka, Norman Powell and Danny Green. Toronto led 30-26 at the end of the first quarter with Siakam (11) and Green (7) combining for 18 points. But Washington outscored Toronto 39-29 to lead 65-59 after a sloppy second quarter that saw the Raptors hit just 11-of-30 shots. The Raptors missed their first five shots before Lin opened his account with a driving layup. Toronto's mood went from bad to worse when Lowry was called for a flagrant foul, Powell conceded a three-shot foul and Nurse, unhappy at the officiating, was hit with a technical late in the half. Lowry headed to the bench with his third foul. While Leonard sat out for the second time in four games with left knee soreness, Lin wasted little time getting involved. The former Atlanta Hawk immediately moved into the backup point guard position behind Lowry with Fred VanVleet sidelined by a thumb injury (VanVleet has undergone surgery and is expected to be out another three to four weeks). Lin, a nine-year NBA veteran who attended Harvard, wore the No. 17 that used to belong to the recently departed Jonas Valanciunas, now with Memphis. His Toronto debut came seven years and one day after he sank a memorable three-pointer at the final buzzer that gave the visiting New York Knicks a 90-87 win over the Raptors. Leonard, who leads the team in scoring at 27.0 points a game, has played in 43 of the Raptors 59 games this season - missing 10 for rest/load management reasons, two for a bruised right hip, two for left ankle soreness and two due to the knee. Toronto is 13-3 without him. Leonard saw action in just nine games with the Spurs last season due to a quad injury. Marc Gasol had seven points and seven rebounds in his third game in Raptors colours. Patrick McCaw missed out with a sore right shoulder.